My friend Lisette once said something like this: People’s contraries make them interesting. She was taking about a feminist she knew who was obsessed with (her own) personal beauty, and I found this alarming. Lisette found a way to be more tolerant. It’s gloomy and wet today, and I was thinking about contraries as I was planting some astilbe in the dry strip of shaded dirt that runs alongside our garage and next to Bob and Mary’s fence. Over my head, the neighbors’ scraggly hemlocks protected me for a while from the rain. Then, the branches got soaked, and the rain started dripping on my head and bent back. I kept going, even though I felt as gloomy as the weather (and maybe it was the weather). 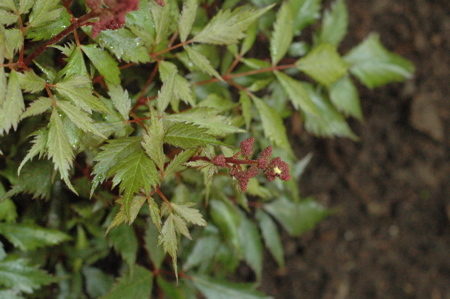 I was determined to get the five astilbe in the ground because the tight-fisted buds on their plumes seem about to burst and I’d like to see that effect in the garden and not in the plastic nursery pot. As I was digging, I contemplated the poor soil and noted an absence of worms and I wondered, for about the 50th time, if I should buy some worms and try to get them established here and thereby really perfect the soil. Or, maybe, I should relocate worms from other parts of the yard, where I have seen them, to here. And then I got a hold of myself. (Buying worms???) After all, what I like about gardening is the challenge of working within limitations: climate, property boundaries, time, environment, geography, energy, money, imagination, water. If I take all those constraints as a given, then what can I do within those constraints that will still be pleasing and not attempt to defy or ignore the limits? Let’s face it, I am not going to grow cactii, or even heather for that matter. I look at the reality of the yard, and I consider what it could be, and what it will not be. Even though I don’t think it’ll ever be a stop on any garden tour, it’s nice, and it offers me many interesting problems to consider (little sun, insufficient worms, clay soil that’s bullet proof in places), and there is always some interesting change, incremental as that might be. I’m pretty realistic about what is and what isn’t going to happen in my garden (and I use that word garden, which seems so deliberate and fancy, with caution), and yet I am pleased by it and optimistic about its potential. I can be both at once: pragmatic, expectant. ← – It’s not the climb; it’s the cliche. This post, beautifully written, resonates with me and my relationship to my current, and first, house. Thanks for this. …but would you recommend the blueberry farmers not buy bees this year? you live in the city and are forcing miracles probably in rocky soil (clay or sand?) and use manure-not-from-your-horse – I see no difference. Em, I guess that point I’m trying to make is that I am resisting perfection. Of course farmers should buy bees, and I’ll buy manure. (Actually, I have only once bought manure.) And I’m also trying to avoid “miracle gardening,” and that attempt to grow things that really won’t comfortably grow in my yard without intense intervention. For example, I’m not going to cart in a truckload of sand, just so I can grow plants I like that prefer sandy soil. I’ll stick with plants that *like* clay soil or poor soil, and there are plenty, and they are doing pretty well in my yard: hydrangea, hosta, astilbe, columbine, etc. I have had a few failures — lupine, for one, and peonies another — when I think I can defy or overcome nature somehow. I’m trying to find the middle ground. And although I don’t grow vegetables (not enough sun, really), I think a lot of organic farmers are trying to do the same, like the blueberry growers.